If you're looking to pick up an XL for some of the upcoming releases, this is the cheapest available by far. From Italy, but completely compatible with games from the UK. Bare in mind that the XL does not come with a charge cable. If you don't have one from a previous DS, you'll have to buy one separately. Hot! 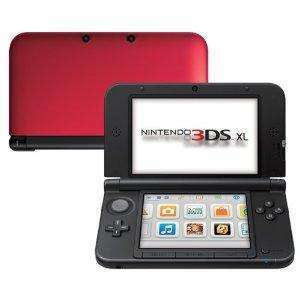 Been eagerly awaiting a good 3DS XL deal! It's also available in blue and silver for the same price (I just ordered a Blue one). It's within the EU. Will be fine. Keep in mind that the Italian post office is pretty ****, so it might take a while before it gets here. A lot of ebay sellers don´t even ship to Italy, just because it went wrong too many times. That's true, they have VERY sticky fingers. Previously orders from Amazon Germany, Italy and France have despatched from within the UK. Any chance of this being true now? It has a good chance, yes. Bare in mind that the XL does not come with a charge cable. If you don't … Bare in mind that the XL does not come with a charge cable. If you don't have one from a previous DS, you'll have to buy one separately. When you say 'previous DS' you actually mean DSi. Power cables from the original DS and DS Lite will not work as they have a different connector. The DSi, DSi XL, 3DS and 3DS XL all use the same type, though - and you can get one for just £2-3 on eBay if you don't mind a third party one. Is there a way to charge a 3DS trough USB? Keep in mind that the Italian post office is pretty ****, so it might … Keep in mind that the Italian post office is pretty ****, so it might take a while before it gets here. A lot of ebay sellers don´t even ship to Italy, just because it went wrong too many times. Besided that, great deal. Completely Untrue! We ship heaps to Italy using Royal Mail (who then hand onto Italy's normal Post Service) & never have problems. In fact we get more issues with UK buyers than any other country! Completely Untrue! We ship heaps to Italy using Royal Mail (who then hand … Completely Untrue! We ship heaps to Italy using Royal Mail (who then hand onto Italy's normal Post Service) & never have problems.In fact we get more issues with UK buyers than any other country! I'd suppose it depends on the items you're posting out, I usually sell games on when I've finished with them on eBay, been doing it for years. amassed about 1500 feedbacks and I will not under ANY circumstances send to Italy. And I'm not alone, like Wong says plenty of sellers won't post there. thanks for being kind enough to share. so around 133 pounds it seems ! This is a subjective arguement, purely anecdotal. I don´t know the business that you are in or what kind of products you are shipping. I imagine you are based in the UK, so it will be logical for you to also sell a lot more in the UK. Just telling what I have found browsing, selling and buying a lot on Ebay, so also very subjective. Good luck to all the people who get this deal, since the price is truely great. does anyone know if dsi xl screen protectors will fit this one ? Works like a charm and for a fiver not bad, also yes it can charge via USB. Nice find, even the Vita is £25-40 cheaper on there as well. Picking one up this week and tempted by this. Cheers. This will be posted from the UK anyway as Amazon is based here for most of Europe (including Italy) I bought my Vita from there. Use this link to determine how much the transaction will cost you in GBP if paying by a VISA card: visaeurope.com/en/…spx. This can automatically account for foreign transaction fees that your bank will apply (e.g. 2% on Nationwide). What language will the box/manual be in? Anyone know? Yeah nintendo got lazy you can pick up a decent 3rd party one from any … Yeah nintendo got lazy you can pick up a decent 3rd party one from any shops i bought this one from asdal[/url]. A bit unfair as the green lobby have been on Nintendo's and phone company's backs regarding wall wart type chargers. They probably thought, ***** it, let them get their own. There are millions in cupboards across the world anyway. not my cup of tea but they also have WiFi PS Vita's for about £145. Use this link to determine how much the transaction will cost you in GBP … Use this link to determine how much the transaction will cost you in GBP if paying by a VISA card: http://www.visaeurope.com/en/cardholders/exchange_rates.aspx. This can automatically account for foreign transaction fees that your bank will apply (e.g. 2% on Nationwide). Tip: Nationwide 'select' gives you the perfect rate and no charges. What is out/coming out, that makes it worthwhile? Just to name a few! Never a better time than now to buy a 3ds. You can actually add that and a copy of Little Big Planet or Playstation All-Stars for just under £150 delivered! Bargain! Hot! Luigi's mansion 2 alone is worth picking one up..also Mario 3D land..I had the original 3DS but sold it after playing and beating Ocarina 3D,I found that screen too small and buttons placed too cramped but the XL is so much better,specially at this price..and who cares about lack of charger..the official one can be bought for 6-7 quick off amazon.I just wish they had the all white or all black colour available at this price,they do have the all white model but for 20 Euroes more..
What's the warranty on these should they develop a fault? Fire Emblem, Luigi's Mansion 2, Super Mario 3D land, Kid Icarus, Zelda: … Fire Emblem, Luigi's Mansion 2, Super Mario 3D land, Kid Icarus, Zelda: Ocarina of Time, Starfox 64 3DSJust to name a few! Never a better time than now to buy a 3ds. add in monster hunter ultimate 3, Donkey Kong: Country 3DS, Mario Golf 3D, Animal Crossing! 3DS is killer in 2013!! Can you add a gift voucher credit to your UK Amazon account to avoid the conversion charge, and then buy using this on amazon.it or do you need a seperate Italian Amazon account? Regarding sending/receiving to Italy, (anecdotally) I've had no issues with the postal service. The reason why some sellers from outside the EU don't send to Italy (and Germany, and others) is because of the long time things can take to clear through (Italian, German) Customs, not because of "sticky fingers". But each to his or her own (...I, too, have had - statistically - relatively more issues selling and buying from within the UK than anywhere abroad). FWIW. As always.